Life on the Selvage Edge: Completed Quilt! Completed Quilt, a photo by Life on the Selvage Edge on Flickr. It's done! And I'm loving it... the bright colors, using up scraps, the fun binding, how the quilting turned out, the flannel on the back, the fact that it stretches from one end of the couch to the other... This quilt makes me happy! It's gotten lots of use in its first days. Our shih tzu loves it, it's made a long car trip with our son curled up under it, and my husband and I have snuggled under it while watching tv in the evenings. Last weekend I put together a Crafting Day at church. Women showed up with different projects in hand... there was quilting, beading, and scrapbooking going on. It was a fun weekend... we started at 9am on Friday and people came when they were able to. Three of us stuck around until 11pm! Then I went back over to church at 9am to open up and a group of us headed out at 8:30pm that evening! Two great days of sewing, hanging out with an awesome group of women, eating soup/chili/snacks, and leaving with an almost complete project. I got the borders added, it all sandwiched together, quilted, and binding machine stitched on. Finished up the handstitching of the binding at home. This was Diane's first quilt! YAY! Tracy was doing some paper piecing. Kelly cut out fabric for something like 7 quilts! She's going to be busy piecing things together in the days/weeks/months to come! Samn working on her first quilt, too! It was fun helping her pick out fabric. It's so her - she loves orange big time and teal and purple are right up there too. She's making a Disappearing Nine Patch. She got all her blocks done... can't wait to see the top all pieced. Nancy's quilt - all the fabrics are paisleys. Love it! Here are all of us with Nancy's quilt! The weekend was nothing but two thumbs up from everyone and there's requests to do this on a regular basis. I'm game! 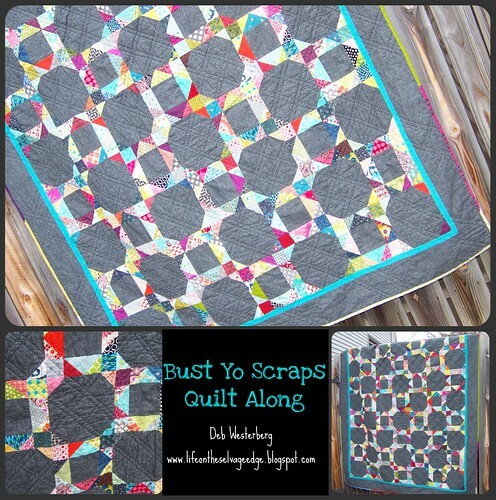 I love how the quilt turned out, the grey background and the double diagonal quilting really do it for me! Visiting through Crazy Mom Quilts and found your beautiful website. I love your quilts -- so full of color and life! your quilt is just stunning! i love all the pops of color against the gray. nice work!!! oh, and your crafty day at church looks like so much fun! good for you for getting together and getting stuff done. it's so much more fun in a group! Pretty quilt! I love the gray with all the colored scraps! You sewed a wonderful quilt! I like the solid grey with the colorful scraps! The gray is beautiful against all of the colors. Nancy's quilt looks wonderful as well.